I should be writing my sermon for Sunday, but I figured I'd start with a blog entry this morning, to get the writing juices flowing, and to empty my head of some other thoughts that are crowding out the sermon thoughts! We're moving to Commercial Drive in three days, and I find myself growing nostalgic already about the place we're leaving behind. I've always been annoyed by this quirk of mine... I tend to get reflective, sad, and even homesick BEFORE leaving a place or person. Soon after I leave, these feelings pass, and I adjust to the change quite quickly. When I shared this with Jodi last week, she called it "pre-grieving", and she said that some people are "pre-grievers" and some are "post-grievers". This has been a real revelation for me. Now I'm trying to embrace the pre-grieving process, instead of being angry at myself for "ruining" the last few days I have here by being overly melancholy. So, a little pre-grieving, blog-style. People who know me well know that what I will miss most about this place is my Rock. Only a couple of days after arriving in Vancouver in Sept. 2005, I discovered the Rock and started visiting it every morning (here's the first blog entry I wrote about it). I'm a morning person, and I've always liked starting the day with God, and I've always liked doing it outdoors, if possible. There are a lot of places that have become meeting places. At our old house in Saskatoon, it was up in the treehouse in the backyard. When I lived at our family's current house in Saskatoon, it was the hill in the park. At camp, it was the secret patch of moss in the woods. But the Rock, my Vancouver spot, became the pinnacle of the meeting places. It's a semi-private place on the beach where God can spread out a whole variety of creatures for me to enjoy with Him. I can sing out loud and usually no one will hear but Him. I have a view of the ocean, the mountains, the city, and the sunrise, and it's only three minutes from my house. Just recently God gave me a gift that helped in my pre-grieving of the Rock. It's linked to the blog entry I wrote recently about seeing new sides of trees and plants. When I got back from Saskatoon a couple weeks ago, I went down to my Rock as usual, but saw something new. 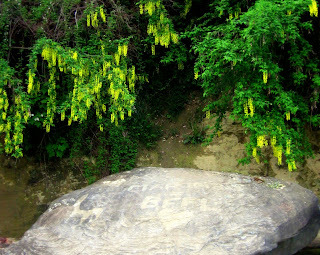 There were bunches of yellow flowers hanging down, like a halo around my Rock. The sun was shining on them, and they were brilliant. 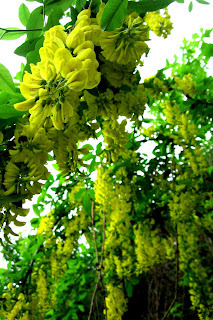 I looked around, but there weren't any yellow flowers anywhere else on the beach. I climbed up and sat in my usual spot, and they seemed to surround me, enclosing my spot with beauty. I realized that I'd always noticed the dried-up pods on that hanging bush, but I'd never imagined what the flowers that produced them would look like. I spent much of that morning just looking at them and enjoying them, and watching the lazy bees they attracted. One of my favorite poets, Gerard Manley Hopkins, talked about the idea of "inscape". He used the word to refer to the deep personality and character of things, often inanimate created things. He would try to use his poetry to "selve" things, to reveal what he saw to be unique in the way a certain tree or a certain rock was created. For me, it felt like the halo of flowers revealed the "inscape" of my Rock. It was as if the created things around that spot always knew it was a sacred place to meet with God, and they were letting me in on their secret, a secret I always knew but could never see physically. I praised God for revealing this hidden reality, and thanked Him for the time He gave me to delight in the fact that we'd really been together, through these three years, in a distinct way, even though I hadn't always realized it.